Invented by Armand GUY this liqueur is a Pontarlier specialty. In 1902 Armand GUY wanted to make a local authentic liqueur. 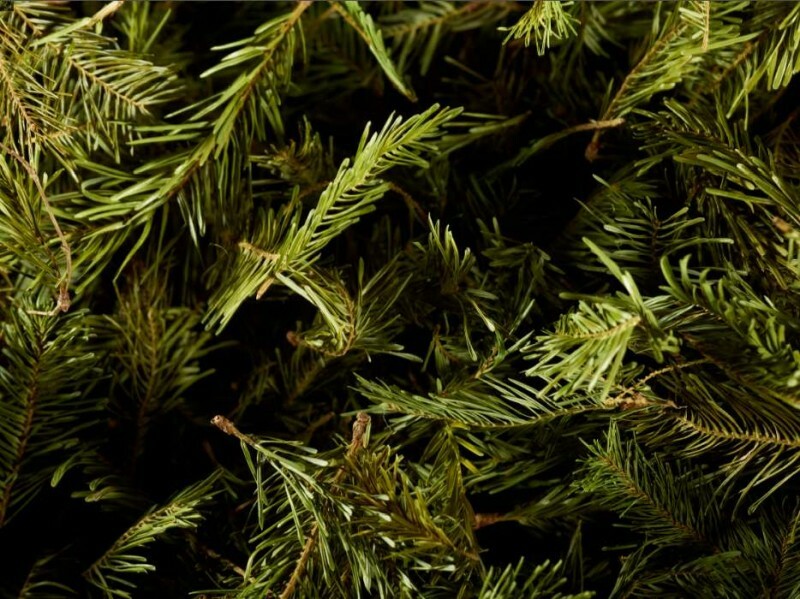 He decides to use the predominant raw material of Haut-Doubs: the Fir tree(Sapin). Based on tree buds and plants, this liqueur gives you a unexpected pleasure reminiscent of the deep wooded Franc-comtoise nature. More on its production below. Vintage add for the Vrai Sapin. 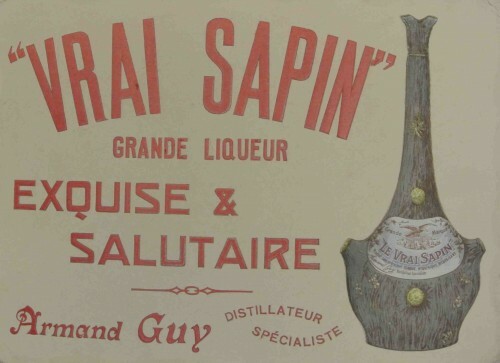 The Sapin liqueur was originally sold in wooden bottles invented by Armand GUY. Manufactured with hazel wood and pine,covered with black papier maché, made to look like bark with a fork, then decorated with some lichen and moss before labeling. The liqueur was called Vrai Sapin to distinguish it from copies, then became Vert Sapin. The GUY family is the only one to possess the original recipe. Gold medal in the global competition of Paris 2016. Only the delicate young buds of the Fir tree (not Spruce) are carefully harvested around Pontarlier, this lets the tree continue with its growth. Fir tree buds recently harvested. The buds are then dried in attics to extract the aromatic essences. The dried part of the harvest is going to infuse with the distilled part of the buds. 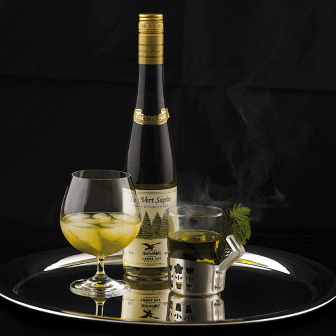 This long and difficult process will bring together the taste and aromas of the wood and sap of the Fir tree. The wonderful deep emerald color of the Vert Sapin is obtained only using plants. This hundred year old liqueur is best drank as an after-dinner drink (serve it cold, even ice cold: its 40° allows it to be kept in the freezer). You can also drink it hot (with hot water and sugar), use it in cocktails, for cooking or use a splash of it to sweeten your Absinthe. For information about their uses in the kitchen or for cocktails, you can go to our section “Guy r’mandises” (The GUY Delicacies) only on the French version. 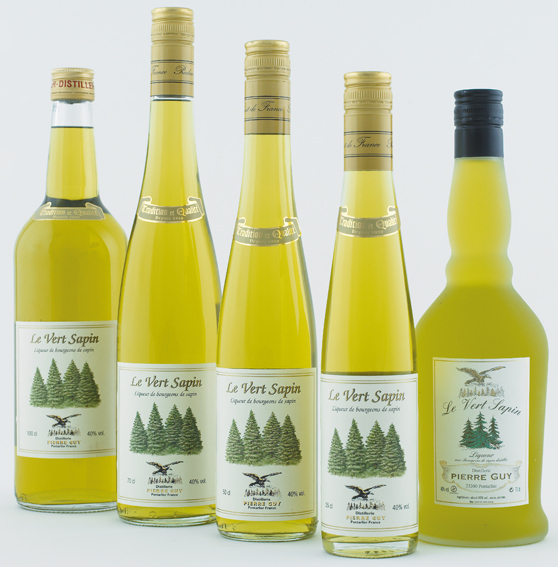 Vert Sapin is offered in many sizes, magnum(1,5L), litre, 70cl (frosted glass or glass bottle),50cl,35cl,20cl in glass bottles and in a 20cl metal flask. You can see the harvest of the buds in the beautiful photos of Outback Images (nature and country parisian publication). > See photo folder. To access PHOTO GALLERY, click on thumbnail.